Description of "Journey of 9ine Months - from womanhood to motherhood"
• How to be joyful during those crucial 9 months? • How to maintain positive attitude while confronting the challenges of pregnancy? • How can one look forward to pregnancy with enthusiasm and prepare physically as well as intellectually for the divine motherhood? • How our Vedic culture can pave way to the mother and child-in-the-womb for a prolific life together? • How to be creative in welcoming the baby from the safe insulated womb to this colorful open world? The Book is in simple language, elaborate and would be beneficial for the ‘First time’ would-be mothers as it will help in reducing their fears and doubts about each phase of pregnancy. The Book gives detailed information about each trimester of pregnancy, and addresses most of the queries of pregnant women. It would help women while planning for their Pregnancy as well as during each individual Trimester. Trupti Vyas is an associate of Institute of Company Secretaries of India besides being legally qualified. She is associated with financial services industry for the past 10 years. Reading has been a passion for her since childhood. Being an avid reader of books on psychology, literature, fiction & non-fiction, she started nurturing intense desire to put her thoughts to writing. Her pregnancy has in fact been the source of inspiration and cause to give birth to twins, her daughter ‘Saumya’ and the ‘Author’ in her. She believes that pregnancy is one the most blissful experiences a woman can ever experience in her life and opens doors to a new world with a bundle of surprises and wonders. 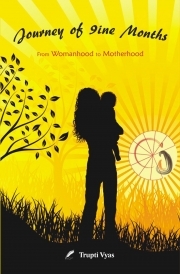 Reviews of "Journey of 9ine Months - from womanhood to motherhood"